Planet Coaster gets a fresh shot of retro DLC – Let’s Play it! Planet Coaster has been one of my favorite games of the last few years, and developer Frontier Developments has been great about releasing a metric ton of free content since the game’s release. Five major updates, including the recent Summer Update that added custom video billboards and audio support, have expanded the game with new rides, security guards, fresh coaster types, and a massive list of quality of life improvements. Recently, we’ve gotten our hands on the first premium DLC items, and I’ve put together a quick video showcasing all three of the themed items in one of my own parks. 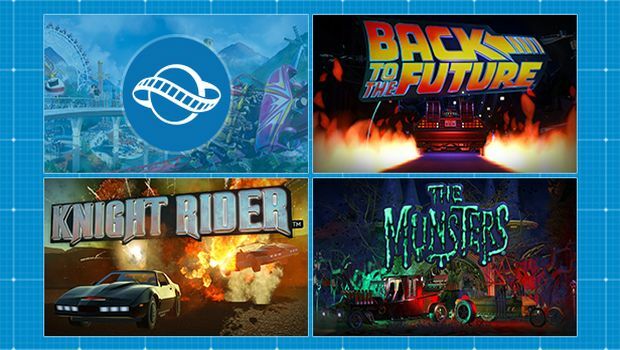 The DLC packs provide cars from Back to the Future, Knight Rider, and The Munsters, as well as all of the individual parts to build them into new things (I’ve already seen somebody mod the car chassis into a Back to the Future arcade ride), as well as smaller versions for use on the Go-Kart tracks, like you’ll see below. Here’s a closer look at what’s in each pack. Miniature DeLorean Time Machine kart for Go-Kart circuit. 2015 DeLorean Time Machine with Mr. Fusion and hover wheels. 1955 DeLorean Time Machine with hood circuits and white tires. 1885 DeLorean Time Machine with circuits and railway wheels. Ten-piece building set for the DeLorean Time Machine. Back to the Future backlit sign. ‘88MPH’ flame trail FX piece. Miniature KITT kart for Go-Kart circuit. Six-piece building set for the KITT, Super Pursuit KITT and KARR vehicles. Miniature Munster Koach kart for GoKart circuit. 27-piece building set for the Munster Koach and DRAG-U-LA vehicles. If you do not want to purchase any additional content, that’s fine! You’ll be able to toggle them on or off by using the ‘lock button’ right next to the in-game search bar. Any items on the Steam Workshop that feature paid content items will be marked with a special tag; if you own the same content items as the Workshop item, you’ll be able to place and interact with that blueprint as you would normally. If you do not own the same content items, you can still subscribe to that blueprint, but you will not be able to place it in your park – it will give an ‘obstructed’ notification as well as a warning that the item you’ve selected included DLC content. The same happens with entire parks that contain additional content; upon opening the park, you will get an in-game notification that tells you this park contains DLC items. You can ignore the notification and fly through the park as you normally would, but any paid content will be locked for you and it won’t function within the park unless you have the correct kit purchased. It takes absolutely no imagination whatsoever to imagine animatronic dinosaurs DLC for a Jurassic Park pack, animatronic shark attacks for Jaws, and much more. If this first foray into paid DLC is any indication of the future, Planet Coaster is growing in an amazing direction.